What’s Your Name Game: What’s Your Summer Cocktail Name? What's Your Summer Cocktail Name? 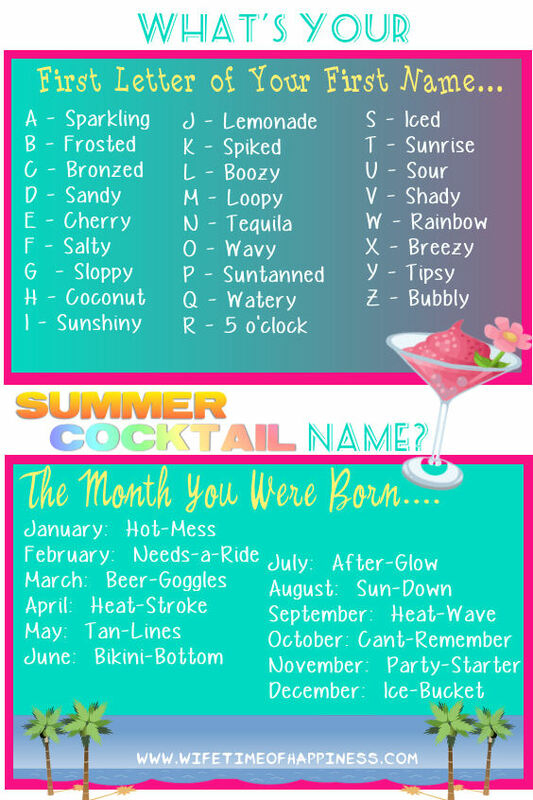 Leave a comment below and let me know what YOUR Summer Cocktail Name is! Don't forget to share with your friends to see what their names are too! Thank you for stopping by, ENJOY!! This entry was posted in Fun & Games, Seasonal: Summer and tagged beach name game, beach names, Canadian PR Friendly Blogger, cocktail name game, cocktail names, facebook shares, facebook summer, Hire a Blogger, name game shares, name games, name games for pinterest, pinterest name game, shares for pinterest, summer fun, summer games, summer name game, summer names, summer shares for facebook, summer whats your name game, summer word list, summer words, tropical name game, whats my name, whats my name game, whats my summer name, whats your beach name, whats your tropical name, whats yourname.